Albertina, of Mimosa Lane, is my guest today. If she weren't such a lovely person, I'd have to be a bit jealous of all her her talent. She's got an amazing eye for design. Both interior design and fashion. She also paints and takes photographs. And, she has a business background and runs a foundation that raises money for brain research. Impressive, no? I've loved getting to know Albertina through blogging and am looking forward to meeting her soon. Enjoy Albertina's pinktastic! Hi Pink Pagoda Readers, I'm Albertina from Mimosa Lane. I'm truly honored to be guest posting here today for Jennifer's 31 Days of Pink series. I love the Pink Pagoda. Can I tell you I have a few of her prints (see here) and have been a big fan of Jennifer's and her wonderful energy and exquisite taste for quite some time. We both live in Dallas and am just dying to meet her. Anyway, unless you have been living under a rock you know that our collective prayers have been answered and Zara home has opened its US online store. I could not be more thrilled. Well thrilled and sad at the same time if I can be honest. Thrilled because they have really beautiful things for the home but sad because it was my secret weapon. Well, you see my husband is from Spain so we go quite often. I would hoard their table cloths and napkins and even buy the cutest baby presents. Everyone here would be all lustful over such beauties. But no more! We are equals now. 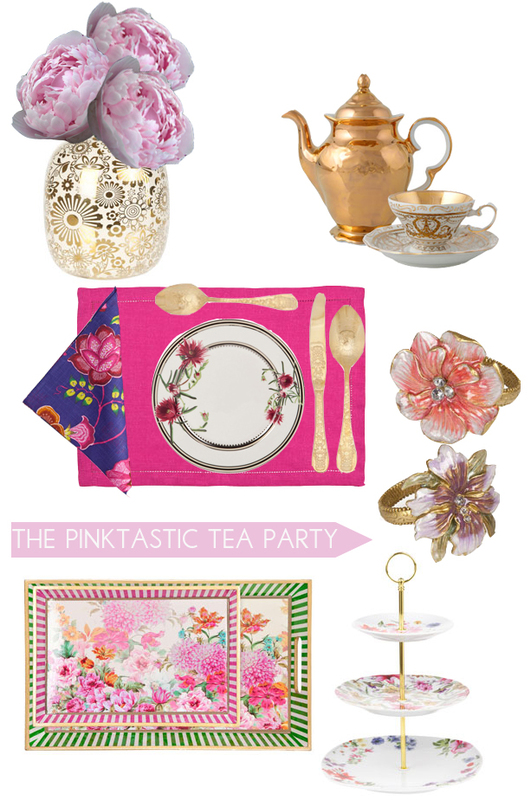 I scoured the site looking for cute pink treasures for your home and this little collage was created- a Pinktastic Tea Party. If you haven't already check their site out. You will not be disappointed! (I mean glasses with gold?!) Crate and Barrel will have to step up for sure. I look forward to visiting Albertina every day at Mimosa Lane. Doesn't her amazing personality and incredible sense of style just shine through so obviously? Thank you so much for being my guest today, Albertina!